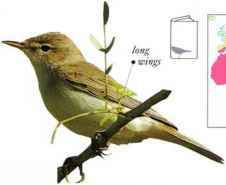 One of the noisier warblers, this bird produces a lively mixture of lilting phrases, mimicry, and harsh noises. It is not shy and. when disturbed, sings vigorously. It is common at the edge of reedbeds, feeding on insects. • NliST A relatively deep and bulky nest, bound to stems, low in waterside vegetation. Breeds in Europe and C. Asia. Winters in tropical southern Africa. 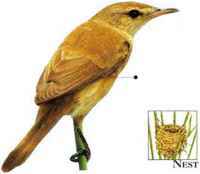 A bulkier version of its northern relative, the Common Reed-Warbler, this insect-eating bird is found in papyrus swamps and mangroves, as well as in reedbeds, across a huge range from Africa almost to Australia. Its song is loud and melodious. • NliST A large, neat cup nest, made of reed leaves or similar materials, lined and slung between stems slightly above the surface of the water. • Distribution Rrom N.E. Africa through Asia to New Guinea. Some populations migrate. Confident in bearing, this warbler is often seen feeding in exposed situations, such as on a thornbush in open grassland. While gleaning insects, it may utter "chuck" notes; the song is musical. It usually breeds in scrub. • NliST A neat cup nest made of grass, twigs, hair, and spiderwebs, placed in a low bush or shrub. 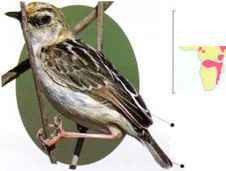 • DISTRIBUTION Breeding range is from S. Portugal, Spain, and N. Africa to C. Asia. Winters in tropical Africa.